Bladnoch Scotch Whisky Distillery was built in 1817 and is Scotland’s most southerly distillery nestles on the green banks of the River Bladnoch. The visitor centre is excellent and one of the best ways to see how whisky was made in the past. In relation to the Scottish Single Malts the distillery produces they are mostly famous for the Bladnoch 10 Year Old and Bladnoch 15 Year Old. The address for the distillery is Bladnoch Single Malt Scotch Whisky, Bladnoch, Wigtown, DG8 9AB and telephone number +44 (0)1988 402235. If you like to contact the visitor centre please call +44(0)1988 402605 for more information. Visit www.bladnoch.co.uk for more information where you will find a website with so much details about the history of this distillery. You will also find that they have a forum set up where you can ask questions and find out all the latest news. If you are needing accommodation near Bladnoch Distillery for your tour please visit Scottish Lowland Whisky Accommodation near Bladnoch Distillery, Bladnoch - DG8 9AB for local accommodation. 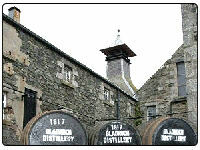 You can see the Bladnoch Single Malt Whisky Range on this website.